My sweet E turns 2 today! I actually found this book after I had sent the birthday box to Phoenix, and had to create to a whole new shipment because every birthday girl deserves a special birthday book! 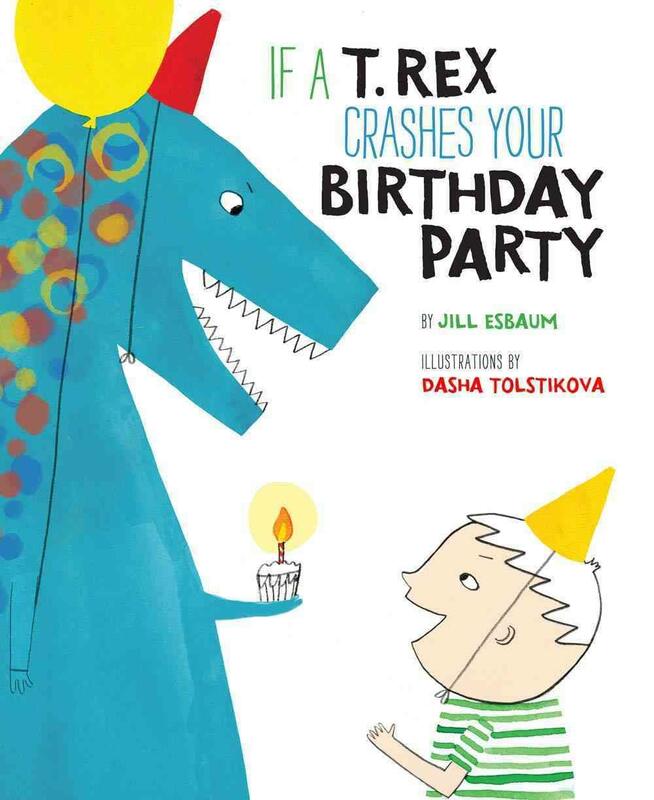 This one perfectly captures the pros and cons of having a T Rex at your birthday party! like he wonders how you would taste with a little mustard. And he'll break all your toys. 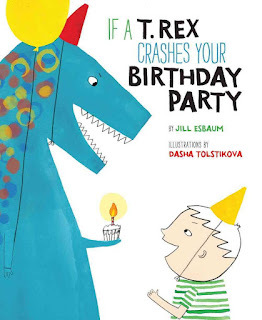 A perfect birthday gift for any dinosaur lover! He throws the information at me as he is going out the door for Thanksgiving break. I tease a little, "I'm going to figure that out, you know. I can look at an eighth grade attendance roster and figure it out in about ten seconds." "No you can't," he says. "You can't figure it out that fast." "Yes I can." We laugh and then he is gone for ten days. I climb the stairs to go back into the building. I have forgotten about E.N. by the time I reach the front door. Monday. The first day after vacation. I have about seven minutes before I am scheduled to be on the playground for lunch duty and I run upstairs to talk to the fifth grade teachers. The eighth graders are scattered up and down the hall, reading MIDSUMMER NIGHT'S DREAM. One tells me that he is reading the play because his brother told him that a lot of people die. I am processing that information, trying to remember which deaths go to which Shakespeare plays, when I run into E again. "Did you look, Miss? Did you look it up?" At first, I don't even remember what he is talking about. "Did I look what up?" "You know, you said you could figure it out in ten seconds." I dig deep, trying to remember what I might have said I could figure out in ten seconds, trying not to let him know that I have absolutely no idea what we are talking about. What did I say I would look up? A book title? A random soccer fact? A high school application deadline? I have been known to look up any of those things for the middle schoolers. He throws out another clue. "You said you could figure it out who it was in ten seconds." Again, I dig deep. 'Who it was…"
I must still look a little vacant, because he gives me a little more information. "Her initials. Remember?" Ohhhhh. Now I remember that quick interchange. One of a hundred, or maybe five hundred or a thousand that I had that day. Ten days ago. But it was the only one I had with him. Dang. What were those initials? E??? E what? E.R? I put on my best private detective smile. "E…?" My voice trails off, hoping he will finish my sentence. He obliges. "E.N., Miss, E.N." "Oh yeah. E.N. I can figure that out. Give me two minutes." Now I have three minutes before I have to be on the playground. I dash into the fifth grade classroom to complete my original mission. On the way back downstairs I mentally run through the eighth grade girls. E.N??? By the time I reach the bottom of the stairs, I think I know who we are talking about. E.N.? He and E.N. are a couple? Really? I check the roster to make sure, but there is only one E.N. I head to the playground. I am a minute late. He is not there. Probably inside making up homework. I pull him aside in the cafeteria. "I know who E.N. is, " I announce. "Does she have long brown hair?" "And she's sitting at the table next to yours?" "And she's wearing a pink hoodie?" "I know who E.N. is." He pushes away to dump his tray and I continue my rounds, willing myself to pay close attention. I never know, after all, when a random kid will grab five seconds to dump a piece of his heart into my lap. 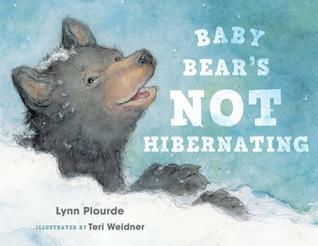 It's time for bed, but Baby Black Bear has decided not to hibernate. "I'm staying awake the who-o-o-o-le winter," he says. He thinks he might stay up all night and hoot with Owl. Or perhaps eat sticks with Moose. He wonders how long it will take him to grow a thick, white coat like Hare. Mama Bear is worried, but Papa tells her he has it covered. And he does. Sweet and predictable, with lovely softly blurred illustrations by Terri Weidner. It's bedtime and the parents think their Sweet Little Nina is asleep. She wants one more hug and kiss. Then she leaps out of bed and heads for a grownup party complete with cake ("You know we don't eat at this time of night!") and sugary drinks, all set up in the living room. Nina terrorizes the party, aided by various assorted aunts, uncles, and other guests, and followed by a pug dog all decked out in an e-collar! You can guess who finally wears out and goes to sleep! 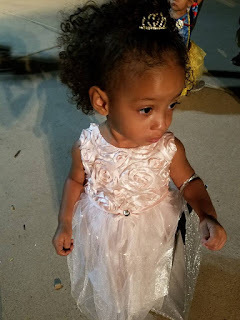 Interestingly, some commenters on Good Reads were concerned about the message this naughty little girl and her lenient parents might send to children. I think kids will "get" the humor! I'm a CYBILS Poetry Judge, so each night this week, I've curled up with a novel in verse. 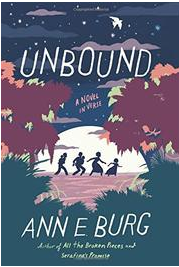 Last night I read UNBOUND by Ann E. Burg. A terrific historical fiction novel in verse, about a part of history I didn't know at all. According to the author's notes in the back of the book, there really was group of slaves who survived by escaping into the Great Dismal Swamp, an area on the Virginia and North Carolina border. Leave your poems in the comments below (I'm still trying to figure out Mr. Linky) and I'll round them up throughout the day on Friday. It's not quite noon on Friday, but the comments seem to have slowed. I'll post the roundup so far, then will come back and revisit it later this afternoon. Michelle Heidenrich Barnes has compiled all of the Today's Little Ditty Poems into a book, which catapulted into Amazon's #1 New Release in Poetry Anthologies! Michelle reminds us that we still have five more days to contribute a poem about refuge and solace to the Today's Little Ditty padlet. Alan, who is more than a little modest, has just published a new book of poetry, I BET THERE'S NO BROCCOLI ON THE MOON. Today, Alan has a post explaining how he uses alliteration in his poetry. Our fourth grades are studying poets' tools right now and I think they will enjoy learning from a master! At Crackles of Speech, Cape Cod poet Steven Withrow remembers the advide given by his grandmother as they walked by a cranberry bog. It's interesting to me how many of us are drawing on the poems and hymns of childhood today. Julie Larios wanted to keep it simple today. I remember saying her poem/prayer when I was a little girl. Heidi Mordhorst offers a hymn she sang to her children when they were little. Carmela wraps up three weeks of Thanks-Giving at Teaching Authors with a tribute to Katherine Patterson. I'm a long time fan of Paterson's novels, but didn't know she has also published GIVING THANKS: POEMS, PRAYERS AND PRAISE SONGS OF THANKSGIVING. I want to buy this book! Anyone thinking about leftover pie? Be sure to check out Matt Forrest Esenwine's original poem, "Pumpkin," from the book DEAR TOMATO. And while we are talking about pumpkins, check out Dori's post, featuring John Greenleaf Whittier's, "The Pumpkin." Kathryn Apel is hard at work on copyedits for a new book, but somehow still made time to write a quick poem. She made me laugh! Violet Nesdoly shares, "To Skin," a never published celebration of our fabulous epidermis! One of those practically perfect poems that make me wish I could write this well! Catherine Flynn says, "the mystery of the moon has offered me a welcome distraction from the turmoil of our world." Her series of original haiku remind me how important it is to look up and trust that all will be well. Brenda Harsham also reminds us to celebrate nature, with a dragonfly haiku and gorgeous photograph. Wow! Molly Hogan captures a scene outside her window with her original poem, "Autumn Pendulum." Margaret Simon drew on a prompt from POETS AND WRITERS, "Make a list of words and phrases that describe the surface textures, odors, and colors that surround you as this year draws to an end… Write a trio of poems, each focusing on one type of sensory input. Select an element–setting, narrator’s voice, repeated words, or a specific object–that stays constant through all three, tying them together" to write her original poem, "Mowing in November." If you have ever tried to explain to kids why, "And it was all a dream" endings just don't work, or if you have ever struggled with writing a good ending yourself, you have to read Ruth's original poem, "Endings." So true! Holly's original poem is accompanied an explanation of how Japan feeds its children who are living at poverty level. Jan Godown Annino is in with two #iamthankful poems. The second one is also an entry in Today's Little Ditty place of refuge. I felt like I was at the beach while I was reading it! Irene Latham, along with Poetry Friday posters Mary Lee Hahn and Heidi Mordhorst, actually drafted a poem in front of an audience at NCTE! She includes "At the Harvest Ball," as well as another poem written by Katherine Bomer. Reading everyone's posts, I'm sad to have missed this fabulous conference again this year. Jeannine Atkins, whose novel-in verse, FINDING WONDERS: THREE GIRLS WHO CHANGED SCIENCE, is also in my stack of CYBILS nominees, participated in several different poetry panels, including one with Irene Latham, at NCTE. I'm fascinated by the amount of research that goes into so many poetry books and would have loved to hear Jeannine interviewed about her process. Mary Lee, describes perfectly how many of us have been feeling for the last few weeks. "My creative spirit… has been sitting out on the porch with her head between her knees for the last couple of weeks." Mary Lee's decided, however, to do something and will be hosting #haikuforhealing during the month of December. Come write haiku with us! Tabatha Yeatts introduced me to a new website, WOMEN'S VOICES FOR CHANGE: REDEFINING LIFE AFTER FORTY. I'd love to have coffee with Tabatha and the three poets she includes in her post today. Little Willow has been sharing "thoughtful songs" all month. Today's "Integrity Blues" by Jimmy Eat World is an important one. Be sure to make time to listen to this ballad. Alice Nine shares one of my all time favorite, favorite poems, "From Mother to Son," made extra special by the reflection by Joe Nathan, a Minnesota school administrator. Jane, a friend from Vancouver, shares "Poem for the Long-ly Wed." In case you want to read the whole poem (I did, after reading part of it), you can find it at Writers' Almanac. This poem is from Garrison Keillor's POEMS FOR HARD TIMES. A lot of us seem to be finding solace, encouragement, bravery, maybe even a little hope in poetry. Linda Baie reminds me to revisit Joyce Sidman's WHAT THE HEART KNOWS: CHANTS, CHARMS, AND BLESSINGS. Robyn Hood Black found some poems in vintage text, then turned them into Christmas ornaments. These would be great Christmas presents! Be sure to check out Myra Garces-Bascal's review of NOCTURNE: DREAM RECIPES before you go! 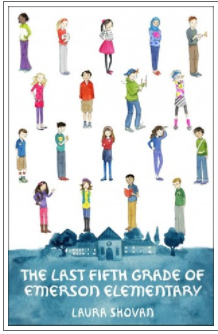 Looks like a book that's sure to delight even the most reluctant reader! Tara Smith is enjoying ECHO ECHO, Marilyn Singer's newest book of reverso poems, which features characters from Greek mythology. I totally agree with Tara, who says, "There are those poets who are able to take this craft and create a new invention of the form, which leaves me all the more envious and dumbfounded: such is the invention of reverso poems by Marilyn Singer." Thanksgiving Eve seems a perfect day to feature poems about food. Mique Moriuchi's collage illustrations, featuring a variety of animals visiting the farmers' market and interacting with the produce are perfect- bright, playful, and colorful. A bonus section includes recipes- salsa, fruit kebabs, lettuce wraps, and cheesy confetti frittata, mini veggie pizzas, and easy strawberry ice cream. 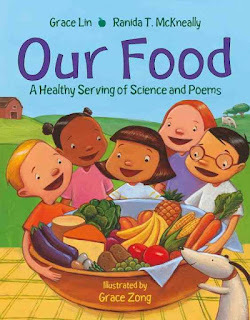 Another food/poetry book I read this week is OUR FOOD: A HEALTHY SERVING OF SCIENCE AND POEMS, is by a favorite author, Grace Lin, and her friend, Ranida T. McKneally. 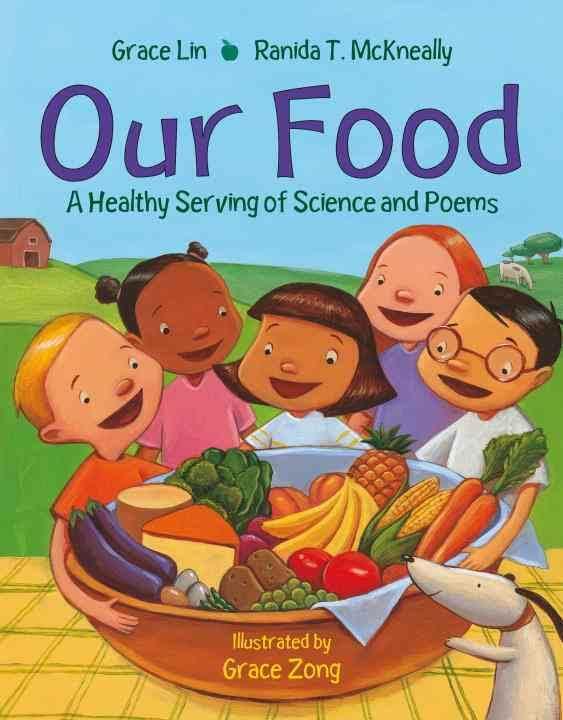 OUR FOOD features haiku from five food groups- protein, fruits, vegetables, grains, and dairy. Do brown chickens lay brown eggs? Do they fight crime in disguise? - What is a fruit? - Why do I have to eat my vegetables? - What are protein foods? - Why are so many vegetables green? - Why are lean meats healthier than fatty meats? - What is the difference between brown bread and white bread? - What makes popcorn pop? - Why do beans make you gassy? - Why are some cheeses so stinky? End pages include a few additional questions, a diagram of the four food groups, and a glossary. A terrific poetry/science crossover! My boys, 21 and 22, are almost grown. And I'm finding it really, really hard to parent them right now. The world we are living in is a really scary place. I fear for my chocolate skinned son every time they go out the front door. I do not know what to say to my boys. I do not want them to live in fear. And yet the world is a really scary place. I worry about the choices they make. about a lady named Gwenevere. that he was driving too fast. about an hour north of Denver. A neighbor stepped in to help. But I don't want them dead. to parent them right now. The world is a really scary place. Keet (short for Keet-Keet Parakeet) is a girl who loves to talk. "You'd talk the whiskers off a catfish,"
"Grab the glue, grab the tape,"
"I'll need to stick on an extra pair of ears." They're right. I like to talk. and wiggly as a worm. Keet's stories stop, though, when her parents decide to move from Alabama to Illinois to be closer to Keet's grandfather. 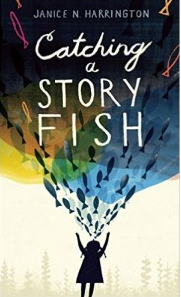 Her new classmates make fun of the way she talks, then her much loved grandfather/fishing buddy, has a stroke, and Keet doesn't know if she will ever tell her stories again. A new friend, Allegra (who happens to be a Latina), and a lovely school librarian help Keet catch the story fish inside of her again. My favorite line from the book, by Doug McVicker, a storyteller that comes to visit the class. "Knowing someone's story is one wayto put an end to a lot of trouble in the world" (p. 152). 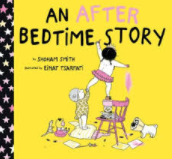 A terrific novel in verse about starting over in a new place, about remembering who you are, about making friends, and about the power of story. I wish I would have had this book at the beginning of the year. It will definitely be one of my first four or fourth grade read alouds next year! Don't miss the glossary of poetic forms at the back of the book. George Washington Furst, the class president who really wants his mom and dad to reconcile. Gaby Vargas, an English Language Learner. Sloane and Sydney Costley, identical twins, BFF's, but very different. Mark Fernandez whose father has recently died. Newt Mathews, frog loving scientist, who happens to have Aspergers. Hannah Wiles, missing her deployed mom. who really don't want their school to close. as they progress through a school year. I love the way the book is designed, with each student having their own icon that appears in the corner of the page. End notes include a description of seventeen different poem forms, with the titles of mentor poems included in the book, 15 different poems, again with mentor poems from the book, and a glossary. Looking forward to sharing this with our fifth graders on Monday! I am a literacy coach at a bilingual school. I really, really, really want people to incorporate poetry into the life of their classrooms. I have tons and tons of books of English poetry, and it's easy for me to offer people lots of choices, but I don't have nearly as many choices for people in Spanish. About a year ago, I stumbled across an Argentinian poet and illustrator, Douglas Wright, who blogs at El Jardín de Douglas. He posts new cartoons, illustrated poems, and songs almost every day. He has some really short poems that he calls bocaditos (nibbles) that our little guys, who are just starting to speak Spanish (and also their literacy coach, who is only a little fluent), can access fairly easily. And our kids love him! en el aire, en el ambiente. The very talented Laura Purdie Salas has the Poetry Roundup today.